Canon 7D Experience - The Still Photographer's Guide to Operation and Image Creation (EPUB format version) is an e-book user's guide and tutorial that goes beyond the manual to help you learn the features, settings, and controls of this sophisticated and powerful camera, plus when and why to use them in your photography. It is the only Canon 7D user's guide updated for Firmware Version 2.0! Written in the clear and concise manner of all Full Stop guides, Canon 7D Experience can help you learn to use your EOS 7D quickly and competently, to create the types of images you want to capture. You can preview Canon 7D Experience at the following link. The preview shows the Table of Contents and Introduction, a sample 7D Menu Settings page, a sample Custom Functions page, and sample text pages. 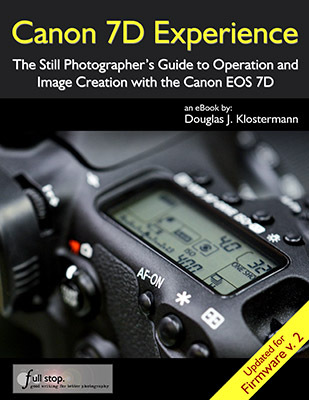 This digital guide to the Canon 7D is a 163 page, illustrated e-book that expands upon the information found in the 7D manual, to help one begin to master their dSLR and learn to use the Canon 7D to its full capabilities. It is packed with helpful information applicable to the new and intermediate dSLR photographer - to begin to turn you into an advanced digital photographer!